Produced from 1998 to 2000, the Aston Martin V8 Vantage V600 was powered by a 5.34 litre 600 bhp fuel injected Tadek Marek V8 engine with twin Eaton superchargers and four valves per cylinder, giving a top speed in excess of 200mph and a 0-60mph time of 4.5 seconds! coupe with 10% more power, the V600 cost £233,700 ($434,500) with all optional features. 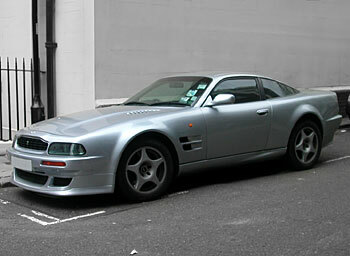 Siteseen Ltd. are the sole copyright holders of this Aston Martin V8 Vantage picture, unless otherwise stated. We only authorise non-commercial picture use and particularly encourage their use for educational purposes. This Aston Martin V8 Vantage Fast Car picture is not in the Public Domain. 1) www.educationalresource.info must be credited as the copyright holders wherever this Aston Martin V8 Vantage fast car picture is used. 3) Use of this Aston Martin V8 Vantage fast car picture, or any of our pictures on websites re-distributing copyright free material is strictly prohibited.